Since summer has finally arrived and school is out, its time to get ready for fun trips with the fam, beach trips, holiday vacations, weekend road trips – whatever you have planned don’t get caught out here without having prepped in advance! Get Organized: As if I don’t have enough arms and fingers to balance bags, a baby plus my own things already… I hate fumbling and searching for all of our boarding passes, stroller/car seat tags and passports when going through an airport. I take my LV Neverfull (which is ALWAYS full) shoulder bag and organize it based on whos going to need what. Its split into thirds, a space for Sean, Bella and then myself, that way I know exactly where everything is and I don’t have to rummage through. Eventually Bellamy will have her own carryon luggage once shes a ticketed passenger, in the meantime mommy lugs it all…. I also have this really cool Passport Holder that keeps me very organized and its easy to locate in my larger carry on. It’s perfect for all our travel documents and it also fits money and Pens! Those damn immigration forms kill me and whats worst is the flight attendants’ never have ink pens, so I carry my own. Planned Entertainment: I prep lots of entertainment options for Bella to keep her from wearing out my personal phone and tablet battery (because she’ll try it). We want to keep her stimulated in airports, in-flight or long car rides so I like to pre-download all of her content at home just in case we don’t have access to FREE wifi once away from home. If you have a subscription to Netflix or Hulu they typically have certain movies or episodes of shows your child follows that are available for download (it takes a while so do this a couple of days ahead of travel). I also like to bring activities that we can do together and small format books that pack well. Im so in love with this cute Felt “Busy” book I got from Target in the seasonal section! (this section gets at least one purchase from me per visit). 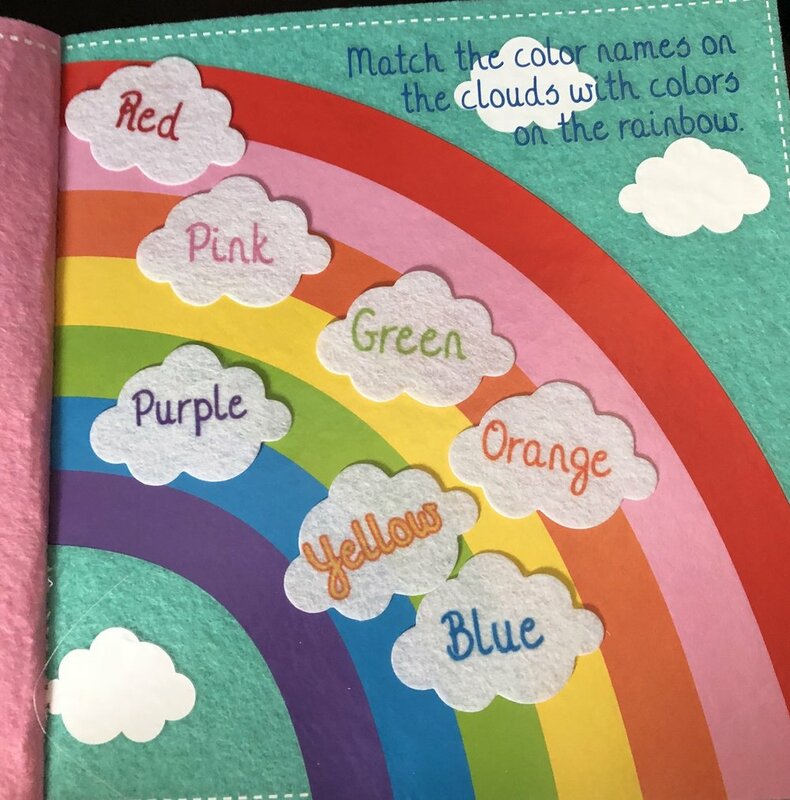 The book is for Pre K + up and has 4 pages of activities that offer critical thinking, spatial relations and exercise fine motor skills, not to mention its super cute! Travel Friendly Baby Gear: When we created our baby registry this was one of the first things I added, I knew we would have two strollers, our big-body that we use on the regular and a smaller one for when we’re flying or in tight spaces like amusement parks. The gb Pockit Stroller is a MUST HAVE in my book. Its sleek and lightweight which is important because when shes not in it we throw it in a backpack, yes its small enough to fit into a backpack, and keep it moving. It stows perfectly as well, once you get the collapsing technique down it’ll become your best travel buddy. Bella will ask to get in her stroller she loves it so much. The color we have it called Dragonfire Red, but its offered in 3 different hues. This stroller is BOMB… so much that its in the Genius World Record Book as the “World’s Smallest Folding Stroller”. Whenever we’re out with it people notice how we break it down and they always comment on how innovative it is and how they wished something like that existed back when they had kids, LOL. My review on the smallest stroller in the world - according to Genius World Record. the gb Pockit Stroller. Snacks, Snacks, Snacks & more Snacks: Noone wants a hangry baby on-the-go so pack some healthy options for your little one to munch on. You don’t want to do too many sweet things that may make them hyper but definitely some of their favorites. If you’re flying you can put them in an insulated lunch bag and let TSA know when going through security if you’re carrying a container with liquid or pouches. We swear by the pouches when away from home. Anticipate Mess: Sh*t happens, right? All the time. Pack several changes of clothes and plenty of extra diapers + wipes in your carryon or an easy accessible bag for car rides. I also like to take travel placemats with us because you cannot trust your babys’ food on just any surface, check out the below for some options we own. It was a very bitter-sweet moment when we stepped off that plane this last trip because it’s the last flight my baby will take for FREE! (Insert tears-streaming down face emoji). Traveling with small ones can seem daunting but don’t let the fear of what could go wrong stop you from living! We were intentional about traveling with Bella at a young age so that we could expand her perspective of different surroundings, different languages and cultures – it’s always a good feeling to know that from each trip and experience we’ve taken away unforgettable memories, despite the work and preparation it takes to get there. What are some of your tips when you travel with your little ones? Im down to hear some of your best and craziest on the road stories too!